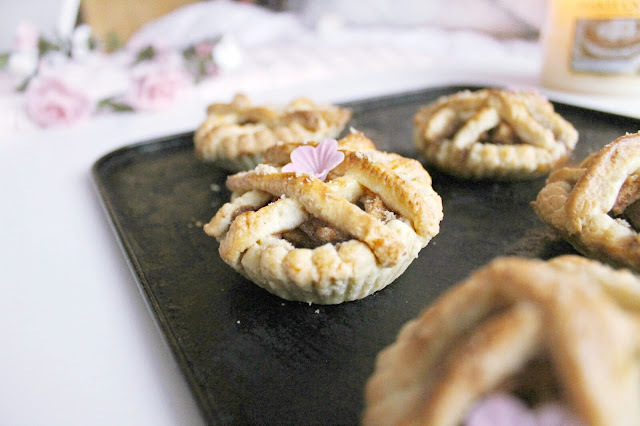 easy to make and are a lovely way to make use of the leftover apples - albeit fiddly to decorate! Rub together the flour and butter to make a breadcrumb-like mixture, then stir in the sugar and salt. Separate the egg and stir the yolk in to the flour, butter and sugar, along with the vanilla essence. Add the water a tablespoon at a time until the mixture begins to thicken and you can make a smooth-like ball with your hands. Leave it to set in the fridge for an hour and, meanwhile, prepare the filling. Wash, peel and chop the apples in to thin slices and squeeze the orange juice over, before mixing in the brown sugar, spices and cinnamon, making sure all the apples are coated evenly. Pre heat the oven to 180 fan and roll out the pastry to 5mm thick once the hour is up. Use a large pastry cutter to cut out circles of dough and arrange them in the wells of your baking tray/foil dishes/cupcake cases. Fill each one with the apples, then re roll the pastry to make the tops. I have opted for a criss cross design after being inspired by the most beautiful pie on Pinterest, from laurenconrad.com. This part can be fiddly! If you opt for a traditional mince pie style crust, make sure to stab the tops once with a knife. Next, use the milk/egg whites to glaze the pastry and bake for 15-25 mins until a lovely golden brown. 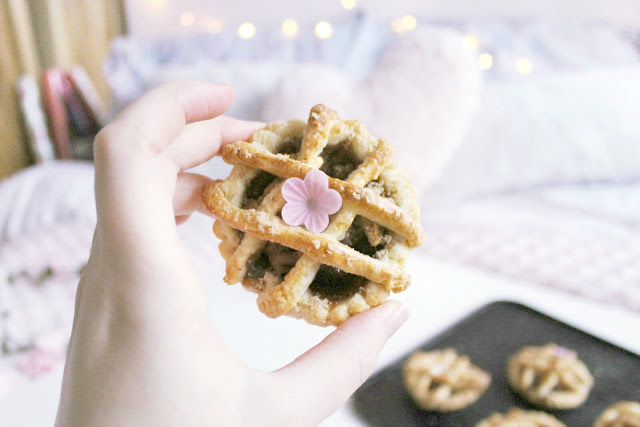 I decorated with a sprinkle of brown sugar and added some mini wafer flowers to finish! 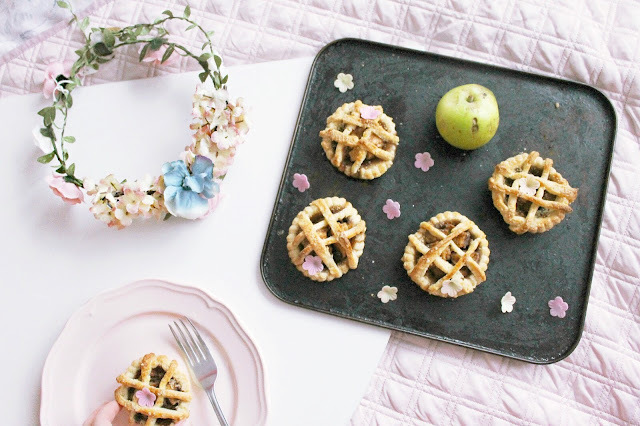 Mmm apple pies are my favourite dessert come autumntime, I cannot resist the tangy apples and lashings of cinnamon ♡ What is your favourite dessert? Thank you so much for your darling comments on my last post! Oh my gosh, they look so pretty and yummy! These are so cute & look delicious! 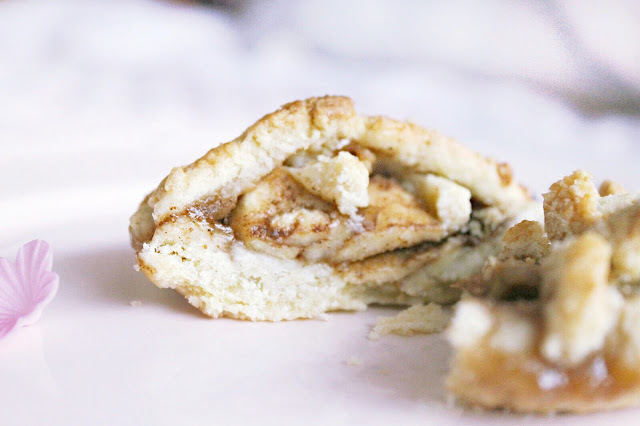 I wish I had this recipe during winter! 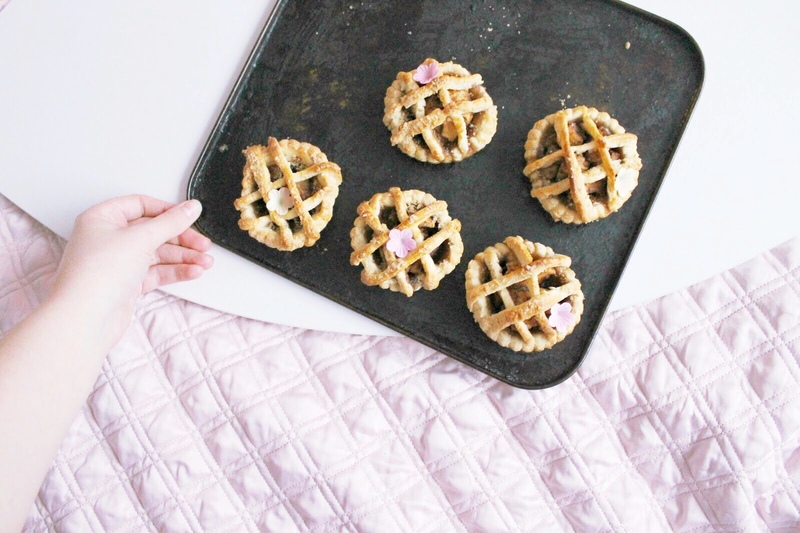 The texture of these pies looks amazing! Omg so yummy! And super pretty to look at too. Will try. Thanks for sharing! These look absolutely delicious. Your photos are making me feel cosy and festive!